Fact: This table from the Kansas Department of Education Data Central site shows total funding last year was $825 million higher than in 2009. The state began properly recording the 20 mills of property tax as state aid in 2015, which was $641 million last year; not counting that, state aid was still $403 million higher than in 2009. Misdirection #2: “districts lost a significant amount of purchasing power, compared to 2009 state aid. Fact: The chart used by PTA is labeled ‘Major School Finance programs -Total.’ PTA is misleading by not defining ‘major’ and they should include all state aid or, even better, use total aid in their chart. Inflation comparisons should be measured against all available funds rather than just state aid because the legislature also is responsible for allowing districts to generate local funds. Available funds also include carryover cash reserves, most of which represents state and local tax dollars that weren’t spent in prior years. 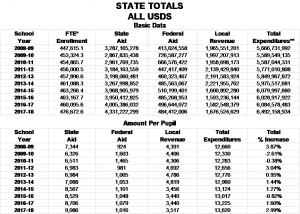 Department of Education data shows K-12 spending was slightly below inflation-adjusted levels for a few years but the KSDE estimate for this year puts total expenditures above inflation since 2009, by about $240 million. But taken collectively, districts could have offset inflation shortfalls by using some of their aid left over from prior years and/or choosing to eliminate some unnecessary spending. 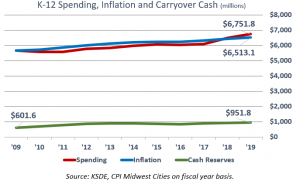 Most of the $350 million increase in cash reserves over the period represents state and local taxes not spent, and that’s in addition to the $602 million accumulated prior to 2009. KSDE does not count cash received but not spent in reported spending totals. It should also be noted that 2009 funding was artificially inflated because the Montoy court ordered spending increases based on a 2001 cost study that has since been proven to have been artificially inflated. Funding over the course of the many-times-amended school funding formula is about $4,300 per-pupil above inflation. Even if KPERS funding is excluded, taxpayers spent a little over $2 billion more on public education last year than if per-pupil funding had been increased for inflation since 1992. Misdirection #3: school funding declined as a percentage of personal income. Fact: According to a 1994 Kansas Supreme Court ruling, the constitutional obligation of the Legislature is to just provide a funding formula; there is no obligation to provide any particular level or amount of funding. But even the current justices, who believe they can order legislators to spend money, say adequacy is based on achievement levels and not a share of personal income. The personal income comparison is simply an entitlement mentality that also fails to consider that some personal income (as measured by the federal government) includes money not available to be taxed and sent to school boards. The two main categories not available for taxation are employer contributions for retirement and health insurance, and personal current transfer receipts, which consist of government social benefits and net current transfer receipts from business. Social security is taxable but not everyone on social security can afford tax increases, and people receiving welfare payments certainly aren’t in position to pay higher taxes. Following the PTA’s logic, school districts would be entitled to more funding from taxpayers if employers’ cost of providing medical insurance increases; the individual has no more disposable income even though their ‘personal income’ increased by federal definition. 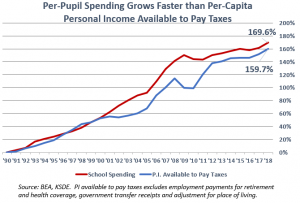 But entitlement thinking aside, per-pupil spending is growing faster than personal income available to pay higher taxes (wages, salaries, proprietors’ income, dividends, interest and rent, less payroll taxes). 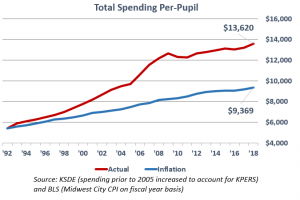 Since 1990 (the farthest year back for which KSDE has spending records), per-pupil spending increased 169.6 percent while per-capita personal income available to pay taxes increased 159.7 percent. Misdirection #4: ‘Montoy safe harbor’ is a reasonable estimate of adequacy and the cost estimates prepared on that basis are reasonable based on multiple cost studies. Fact: In March 2014, the Supreme Court said adequacy is achieved when funding is reasonably calculated for students to meet specific outcomes. Montoy safe harbor cannot be a reasonable estimate because nothing in Montoy was calculated based on achieving any sort of achievement. Misdirection #5: The current school formula was found to be just short of adequate. Fact: The 1994 Kansas Supreme Court said the Legislature is obligated to provide a system of funding (like a formula) and not any specific funding level. The constitution also says only the Legislature may appropriate money. For these and other reasons, many constitutional scholars say the formula cannot be found ‘short of adequate’ because the court has no authority to do so. Misdirection #6: Kansas is one step away from ending litigation. Fact: The court said funding had to be inadequate because about 25 percent of students were below grade level. If all students aren’t above grade level in a few years, the plaintiffs will be back demanding more money.